Hi guys! If you are a regular reader of the blog then you may be aware that when it comes to haircare, there are certain ingredients that I avoid. Things like silicones and SLS can build up or be harsh on the hair, and even though some may be fine with them, others prefer to avoid them for better hair health. For those who prefer to avoid, there are thankfully products that are available that avoid all of the nasties, and today I will be looking at a couple. Louise Galvin, British "haircare Queen", is passionate about creating carbon neutral beauty products that are great for your hair as well as the environment. She has released two different hair ranges, the more affordable Natural Locks range and the Sacred Locks range that includes shampoos, conditioners and hair masks. I was recently sent a couple of products from the Sacred Locks range as a gift from Louise Galvin, so I have decided to review them for you all today. The products that I have to show you are the Sacred Locks Shampoo and Conditioner for Fine Hair. 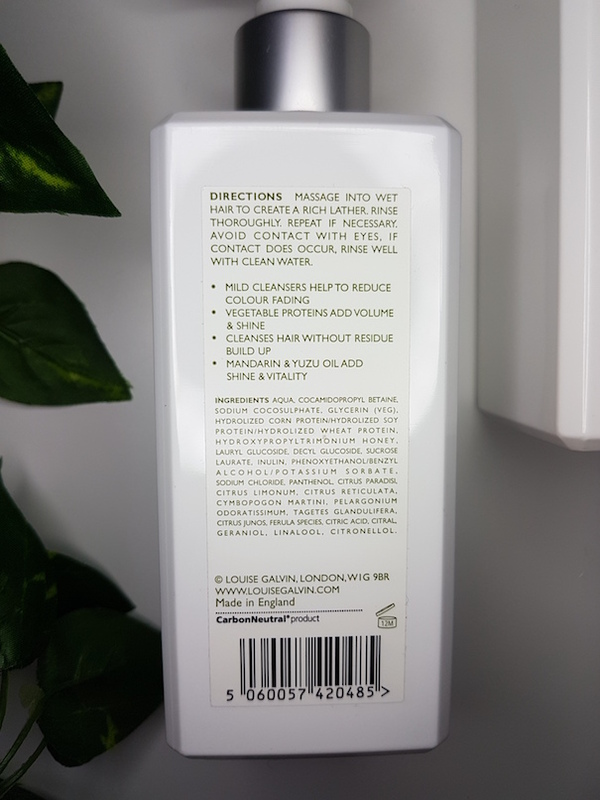 The shampoo is described as a clarifying shampoo that contains mild cleansing agents and citrus oils that keep the hair clean without any silicone build-up or greasiness. The conditioner is described as intensive but light on the hair, leaving it shiny, smooth, with added volume and with no fly-aways. 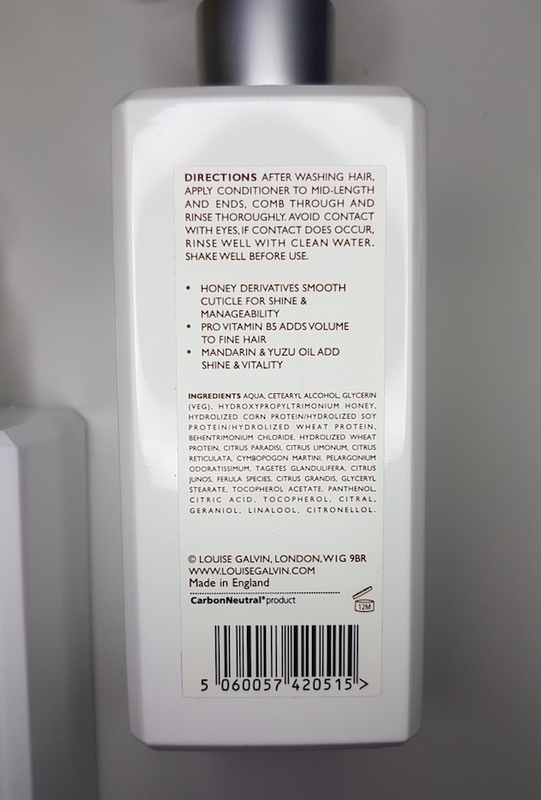 Both products come packaged in the typical white rectangular bottle as the rest of the Louise Galvin products do (but the Natural Locks range comes in black) with pumps at the top to dispense the product. Each bottle holds 300ml of product. Being natural doesn't make them any different in terms of application. Apply the shampoo to wet hair, lather and rinse. Wash twice if you need to. With the conditioner, apply it to the ends of the hair and rinse away. The citrus oils within the formulas instantly give both of the products a beautiful fragrance to them. It's such a fresh and clean scent, but also rather luxurious. I have short hair, so I find that one pump of shampoo is enough to clean my hair, but for longer hair I would suggest 2-3 pumps. It does lather up well, but if you aren't used to using natural shampoos you may think that it doesn't. This is because of the lack of harsh cleansing agents, but lack of foam does not mean lack of cleansing. This shampoo does a great job at cleansing the hair and leaving it light but smooth and shiny. With that said, I find it worth noting that when people have been used to products that do contain silicones and harsh cleansers, they sometimes don't feel that their hair is really "clean" when they first start using natural shampoos. This is because the cleansing agent is milder and not as capable at ridding the hair of the silicone build up left behind, and it can be solved by using a clarifying shampoo first. As this is described as being a clarifying shampoo, hopefully it shouldn't be a problem (it's hard for me to confirm as I went through the transition period many years ago), but I thought that I would cover it anyway to cover all bases here. With the conditioner, I find that one pump is enough again for my short hair but I assume far more would be needed for longer hair. It isn't overly thick and spreads well throughout the hair and washes out easily too. I've tried some conditioners in the past that take a long time to rinse out, but thankfully this isn't one of those. My hair doesn't get very knotty, but it can still be a little annoying at times to brush post-washing. I don't come across any issues with brushing my hair after using the Sacred Locks Shampoo in comparison to other natural shampoos and conditioners, but if you have longer hair and haven't used natural products to wash your hair before you may encounter a couple of knots compared to what you are used to. This is because of the lack of silicones, and to save me going into more details I'll direct you to Louise's website where she explains it very well. Once dry, hair looks and feels so soft and bouncy. The conditioner doesn't weigh down the hair like other conditioners can, but it also feels moisturised and healthy. The products also add a beautiful shine to the hair and it also helps to keep the scalp moisturised and clean. If you prefer to wash your hair daily (like myself), these products are gentle enough to do so, even though the shampoo is clarifying. Overall, I am a huge fan of the Sacred Locks Shampoo and Conditioner for Fine Hair. Not only do the bottles look great in your bathroom, but they are fantastic products. 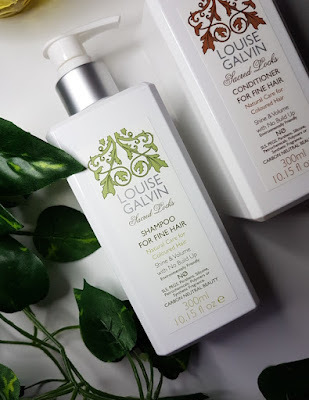 I’ve been a big fan of Louise Galvin products for many years, and that’s because they work well. It’s not just the hair related products, either. 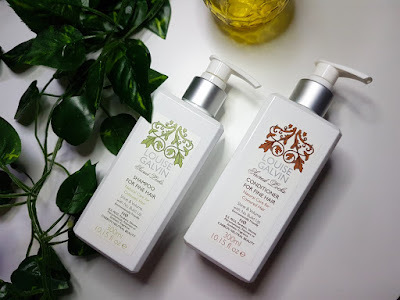 Louise Galvin also sells a couple of body products, one of which I’ve reviewed on the blog before - the Sacred Skin Hand and Body Lotion - and they are also great. If you are on the hunt for a new, natural shampoo, I do wholeheartedly recommend that you try them out. Also, if you are looking for further tips, Louise contributed a tip to my Top Beauty Tips for 2018 post, so make sure that you head over there for further hair inspiration! 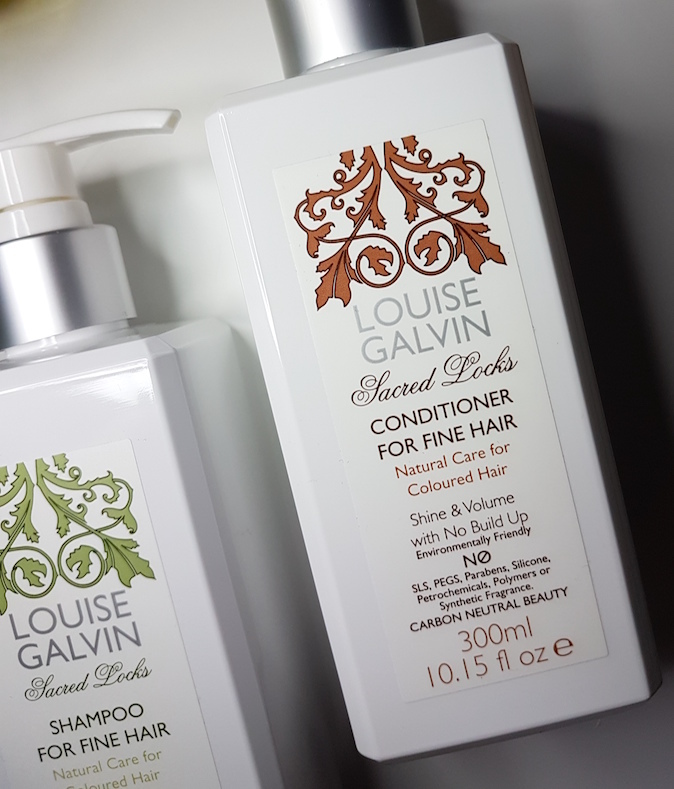 You can purchase the Louise Galvin Sacred Locks Shampoo and Conditioner for Fine Hair from Look Fantastic or Louise Galvin. What are your thoughts on the Louise Galvin Sacred Locks Shampoo and Conditioner for Fine Hair? What are your favourite natural hair products? *These particular items weren't sent as PR items to review, but they were sent as a gift from Louise Galvin.